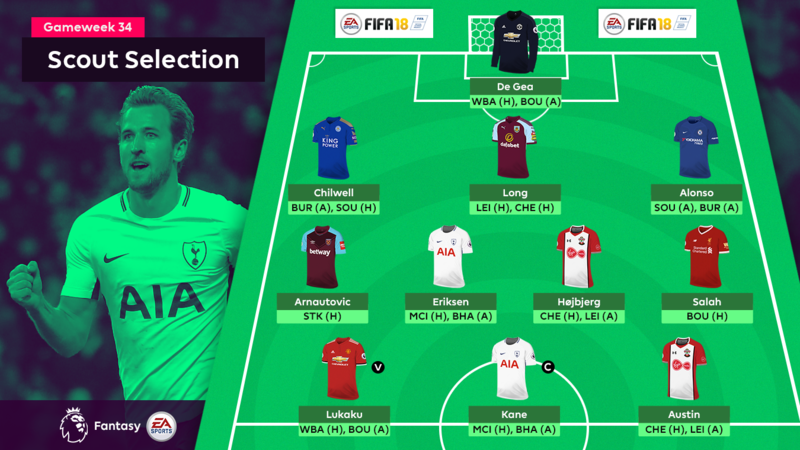 Fantasy Premier League managers must find some value players if they want to maximise the Double Gameweek 34 players in their squad. 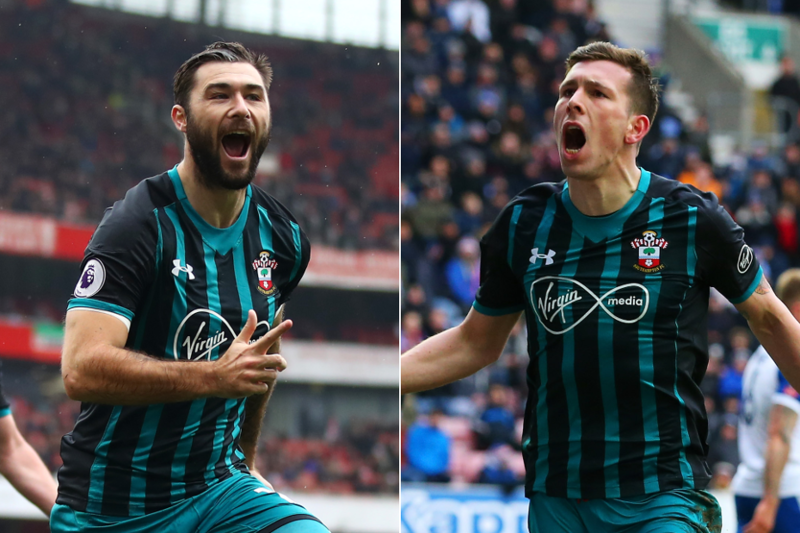 Charlie Austin (£5.8m) and Pierre-Emile Hojbjerg (£4.3m) two such targets who can help balance the books, while providing points of their own. The Southampton pair are in The Scout's best XI, freeing up vital funds for two big-name strikers. Goalkeepers are so often the big points scorers in Double Gameweeks. Manchester United play West Bromwich Albion at home and AFC Bournemouth away and De Gea’s average of 4.8 points per match is the best for his position. The left-back retains his place in our XI ahead of matches with Burnley away and Southampton at home. Chilwell has started nine of Leicester City's last 10 matches and created 11 chances over that spell, third only to Marc Albrighton (£5.6m) and Riyad Mahrez (£9.0m) for the Foxes. Long could be the only £4.0m-priced defender to play two matches in the Gameweek. He earned an assist at West Brom last time out and is set to continue to deputise for the injured Ben Mee (£4.9m) over home matches with Leicester and Chelsea. We keep faith with the wing-back ahead of his two fixtures at Southampton and Burnley, despite a run of five appearances without a clean sheet. And although he also has zero goals or assists since Gameweek 22, no FPL defender has fired more than his 16 shots over that period. Arnautovic can deliver big despite having only one fixture in the Gameweek. He has nine goals and five assists in his last 14 starts and will likely lead the West Ham United attack against former club Stoke City. He got a goal and nine points in the reverse fixture. The Dane has five FPL goals in his previous nine Gameweek starts and has created more chances than any Tottenham Hotspur team-mate in that spell. Eriksen is perhaps the most likely of Spurs' attacking midfielders to play both matches against Manchester City at home and Brighton & Hove Albion away. The Southampton midfielder is our Gameweek 34 makeweight, freeing up funds for big investment in attack. He has started every match under manager Mark Hughes ahead of two fixtures: Chelsea at home and Leicester away. He scored at Wigan Athletic in the FA Cup and only Charlie Austin (£5.8m) has had more than his four shots for Saints over the last two Gameweeks. With an average of 9.5 points per match at Anfield, Salah can outperform those players who have two fixtures. The Egyptian has recorded nine double-figure scores in 15 home starts, while AFC Bournemouth arrive on Merseyside with a single clean sheet since Gameweek 14. With three goals and two assists in his last five Gameweeks, the United striker goes into matches with West Bromwich Albion and AFC Bournemouth in fine form. Fourteen of his 15 goals have come against opponents outside the top eight. Four behind Salah in the race for the Golden Boot, the striker will look to add to his 25-goal tally over Spurs’ two Gameweek fixtures. Kane is our captain having earned more new owners, 124,000, than any other player ahead of Saturday’s 11:30 BST deadline. The striker earns selection after his goal in a 16-minute cameo at Arsenal in Gameweek 33. Austin will now push for starts over Southampton’s two fixtures and has six goals over his previous six when named in the starting XI.